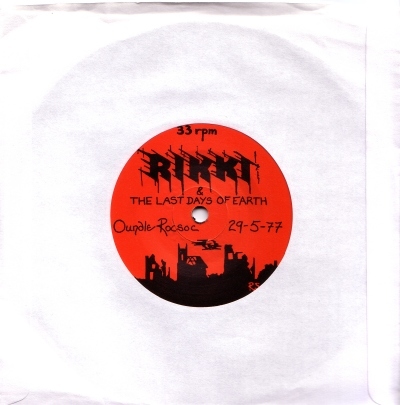 Rikki & The Last Days of Earth debut 7"
.....so what's so interesting about the Rikki & the Last Day's of Earth debut? Well first of all it's a true DIY punk record from early 1977. One sided, 33rpm, no sleeve, self financed. The most interesting thing by far is the record label: "Oundle Roc Soc" or to be more specific 'Oundle School Rock Society'. The fact that Oundle School, one of the most exclusive private boarding schools in the UK, had a rock society in the '70s with enough motivation to release a record AND the fact that it wasn't some prog rock Genesis wannabe act makes this genuinely bizarre! If you were at Oundle when this record was released I would love to hear about it. I've included images of both sides of the record as despite being one sided the b side has a label. 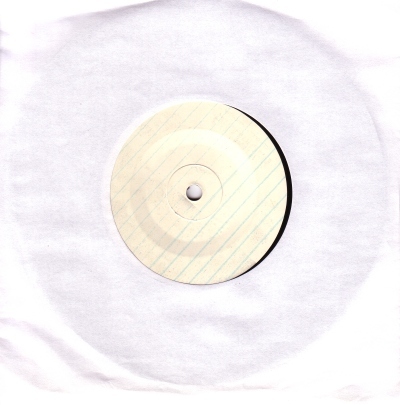 This is kind of weird in itself as one sided records usually have no label on the b side. Weirder still the label looks like a page ripped out of an old school note book! Surely not? !